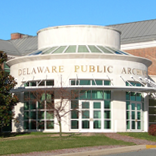 On Saturday, April 29, 10:30 a.m., Delaware Public Archives and Delaware Division of the Arts will present a program at the Archives building titled “Rediscovering Delaware Artist Stanley Arthurs.” Presented by author James C. Thompson, the program will focus on the contributions made to the art of illustration by Stanley Arthurs, one of Howard Pyle’s most able protégés. In the nearly eight decades since his death, Arthurs has drifted out of the public memory. The presenter will discuss Arthurs’ life and resurrect the artist to his rightful place by discussing the scope of his career and his connection to Howard Pyle. The backdrop for his comments will be one of Stanley Arthurs’ most memorable works, The First Day of Peace, which Arthurs painted in 1923 and is on display at Delaware Public Archives. A former resident of Wilmington, Delaware, James C. Thompson is the author of numerous publications, including his latest book PAINTING AMERICA’S PORTRAIT – How Illustrators Created Their Art. A graduate of University of Virginia, Thompson’s presentations have appeared on CSPAN’s History Channel and other television and radio programs. The speaker has also presented lecture series for continuing education programs at University of Virginia, College of William & Mary, George Mason University, and University of Delaware.